Department of Pharmacology, Saveetha Dental College, Saveetha Institute of Medical and Technical Sciences, Saveetha University, 162, Poonamalle High Road, Velapanchavadi, Chennai, INDIA. Background: Advanced glycation end products(AGEs) are formed by non-enzymatic glycation of proteins that enhance vascular permeability in both micro and macro vascular structures by binding to specific macrophage receptors. AGEs affect nearly every type of cells and molecule in the body and play causative role in the vascular complication in diabetes mellitus. Materials and Method: AGE reaction solution was constituted with 10mg/ml bovine serum albumin in 50mM sodium phosphate buffer (pH 7.4) and 0.02% sodium benzoate into 0.2M fructose and 0.2M of glucose. 2.5 ml of the reaction mixture was treated with lutein (10, 20, 40, 60, 60, 80, 100, 120, 140 μ g/ml in methanol). Amino guanidine was used as the positive control. After incubating at 37°C for 7 days, the fluorescence intensity of the reaction was determined at excitation and emission wavelength of 350 nm and 450 nm, respectively, using a multimode reader. The percentage activity was calculated with respect to solvent control. 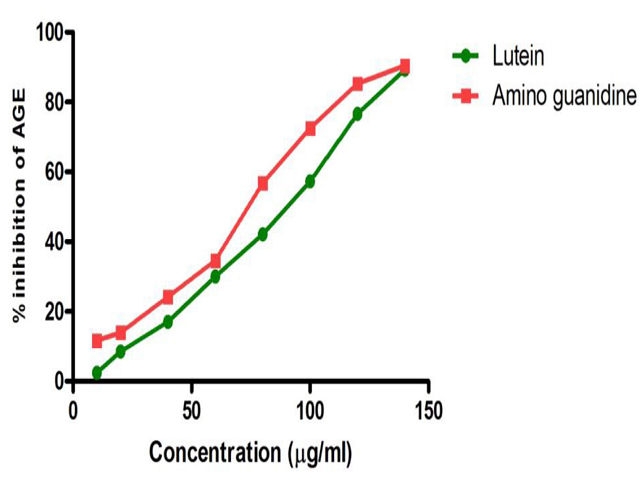 Result: 7 days of exposure to lutein showed a maximum inhibition of 89.27±0.24 % at 140μg/ml and Amino guanidine exhibited 90% of inhibition. The IC50 of Lutein for AGE inhibition was found to be 77.78μg/ml and for AG, 72.66μg/ml.Conclusion: The non-enzymatic adduct formation between the keto group of sugar and amino group of proteins is one of the molecular basis of diabetic complications in hyperglycaemic state. Inhibition of this process will be useful in the management of diabetic complications. Lutein showed dose dependent inhibitory effect on the protein glycation.Hence, it may be used for the management of diabetic complication. Graph showing inhibitory effect of Lutein on Advanced Glycation End product. Gayathri KR, Anitha R, Lakshmi T. Inhibition of Advanced Glycation End-Product Formation by Lutein from Tagetes erecta. Pharmacognosy Journal. 2018;10(4):734-737.